Because I’m really trying to get in the spirit of the user’s head as their primary controller, I’ve gone ahead and started modeling a small variety of “launchers” to place on the user’s virtual forehead. I think I may allow them to switch between a few options or remove it entirely if desired. 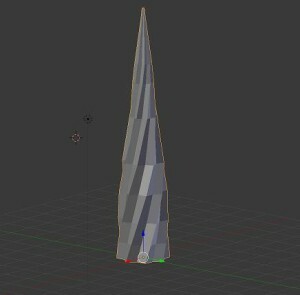 The obvious first choice is a unicorn horn, and here is my first attempt at modeling a low-poly one, or using Blender pretty much at all. Not bad for someone whose last shot at actual modeling took place on an SGI Indigo2. 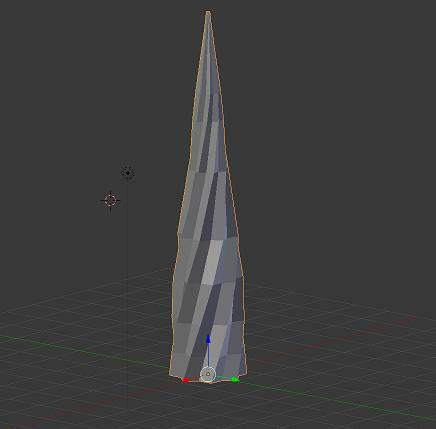 Texturing and figuring out the UVs will have to come later. Doing all this stuff myself really makes me once again appreciate all the artists who made far more complex things than this on a daily basis. While more luxurious VR units have head straps and headphones, etc. Google Cardboard is often meant to simply be held up to the eyes for short, controlled bursts of VR. Since it does not have positional tracking, the user laying prone is ideal for Cardboard, since the range of movement is limited and not likely to get out of sync with the VR experience due to users shifting in their seats, trying to move their heads closer to objects, and so on. For this reason and because I like to be a bit weird, I’ve started my first VR projects with the sky as the canvas. One of VR’s strengths is its ability to convey scale, and there are few environments so vast as the sky. One of its drawbacks is that small details are often lost, which is also helped by focusing on the sky, rather than nearby objects and environments. My first project has a working title of “Forehead Fireworks” and is a VR experience of the user laying on a bed in the middle of a grassy field at night. The user is able to fire colorful fireworks out of their foreheads into the starry sky. The first priority for this project will be to create as convincing and engaging a skyscape as I am able given the technical limitations of the mobile platform, which I will expand upon in a later post. In order to motivate myself to work on this project more regularly, better understand my development process, and maybe help others who encounter similar issues, I’m going to keep a development diary here for the rest of my VR project. I am committing to two posts a week until the project is published. I intend to submit to Apple by the end of April. Beyond that we shall see. This blog is in the spirit of open development, so please feel free to e-mail me at kenneth@kennethmoodie.com or hit me up on twitter @kenmoodie if you have any questions or wish to discuss.